Today's E3 Nintendo Direct featured plenty of footage of games not previously seen, with the most hyped arguably being the new Super Smash Bros. Most encouraging was the fact that the trailer showed a lot of gameplay footage alongside CGI flourishes, with plenty of favourites duking it out. The footage showed both the 3DS and Wii U version, starting with the handheld iteration. In a clever touch, the portable's visuals are adopting an appealing cel-shaded look, with the transition to Wii U then adopting a far more detailed style similar to its Wii predecessor. Most footage was then on the Wii U, with arenas glimpsed covering various franchises, and the fighting looking largely familiar with what we've seen before. The big reveal was saved for the end, with Mega Man being confirmed as a new challenger. He looks like a modern version of the character from the 'classic' series best known on NES, and quickly moved from a standard blaster to incorporate special moves from defeated Robot Masters, which is sure to delight fans of the franchise. It was a blast of Smash Bros. madness, which was simply given a 2014 date, and undoubtedly a tantalising first glimpse — let us know what you thought in the comments below, with the main trailer followed by the Blue Bomber's appearance. The game looks EXACTLY like Brawl. Mega Man is a pretty cool addition, but it could easily have been DLC in Brawl. Awesome.. I love how every game shown off today looks like an animated painting. I love these art styles. My body is Reggie for all of these games. HNNNNNNGGGGGGGGGGHHHH OH MY GOD SO MUCH HYPE! Capcom, thank you for doing something right. @Yasume No it really doesn't and no he couldn't since Brawl had no DLC ability. Mega Man is an excellent addition. Just bring back Sonic and I'm good for third party characters! The Hype . So excited. Huge fan of megaman. @Yasume What did you expect it to look like? I think everyone was expecting an HD Brawl. AAAAHHHHHHHHHH!!! NOTHING ELSE MATTERS AT THOS PONIT! No mention of the Animal Crossing villager, based on the trailer I assume he's in. My heart was beating so fast it blew out of my body like a bat﻿ out of hell. Now can I get both wiiu and 3dsthe copies cheaper if I buy together? I thought the 3DS version - cell-shaded with the horrible black outline - was making fun of PSASBR, it looked just like it. WiiU version was much better. Too bad my stream was a stuttering slide-show, couldn't really enjoy it. Hoping it's somewhere like Gametrailers later. Or the Wii. For those thinking this was a 2013 release, I don't think that was ever realistic. Make some of the previous assist trophies playable! There were some characters' potential was not tapped into! hmm...looks like I have to get started on the MegaMan franchise...where is a good, not too crazy hard place to start? I saw a glimpse of gameplay and it looks nice. The Animal Crossing Villager scared me a little, though. Mega Man it's good to have you back! @Joshers744 Mega Man X would be good place to start. It's on both the Wii and Wii U VC. The villager..... That is just brilliant! Yes Mega Man is here, now we just need Pac-Man, Bomberman, Simon Belmont, Lloyd Irvin, and the return of Snake and Sonic. Wah! Where's Waluigi? Eh, no matter. This game will be fan-stinkin'-tastic with or without Waluigi! Some pics we didn't see in the trailer as well! I cried tears of joy when I saw the Smash logo at the beginning of the trailer and cried through out the trailer. I, I, I.... Then wet myself when Mega Man popped up. I'm not embarrassed to say it. Because; Smash Bros.
Man that reveal was glorious! I was giddy watching Megaman appear, he is a more then welcome addition! Didn't see the animal crossing guy coming that's kind of meh but im not going to criticize, I made that mistake with olimar. I noticed a change in Pit's move set, this pleases me. 3DS stylized graphics look like poopydoopy but ill get over it. Megaman! OMG I was shouting Yes! at the top of my lungs, in the past I voted for the removal of all 3rd Party fighters but I am all over this! Remember guys, there is a second Nintendo event today and a Pokemon Direct. We might get more info then. @Joshers744 Mega Man X would be great, but if you want the true Mega Man experience you have to be ready for a bit of a challenge. The original series for NES is available on every system on the planet, start with #1 and work your way up! Man! I didn't see ANY of the Brawl footage except a 2 second static pose of mega man that i caught by suprise which lead me to mini jump off my chair and say "ooo! ooo! "lol That streaming was just awful, especially during the brawl unviel. I need to watch ALL of the footage all over again. Anyways, got my wish! That 3D Mega Man is EXACTLY how he should look in a new 3D re-imagining. He looks like an exciting new character if you hadn't had previous experience with him and he is immediately recognizable to those who do. Love the geek moment where they show him fighting Samus. Hand-blaster FIGHT! Also, the 3DS stylized graphics are a great move. You have to SEE the fighters while you play on that dinky screen and if you zoom in to close it would be a huge disadvantage. It looks good. It's not "cel shaded" either, btw, it's just a inky black outline, the textures are all there. AC Villager is gonna stomp all over Mega Man's face. Am I missing something? I did not see Mega Man in the video?! There is a 99.9% chance that Metroid will be on the Wii U. Miyamoto acknowledged it by hinting that the controls and viewpoint are going to be in the direction of Metroid Blast (which is perfect). I completely agree about Kid Icarus, but the guy who does that is the Smash Bros. guy and he's busy until some time in 2014. I can only hope that there are people getting it going on the Wii U before he gets involved. @Fingeldor You missed the best part of that video, then. It will be online later. The live stuff was kicking out early for people. Edit: Oh, I see, the youtube video is missing the reveal! Bummer! @Joshers744 Mega Man 2 and 3 on the Wii or 3DS VC is a great place to start. 'course the video screwed up on me before Mega Man showed up! THIS IS BIG NEWS!!! Let me remind you guies it was begging that got him in Smash4. 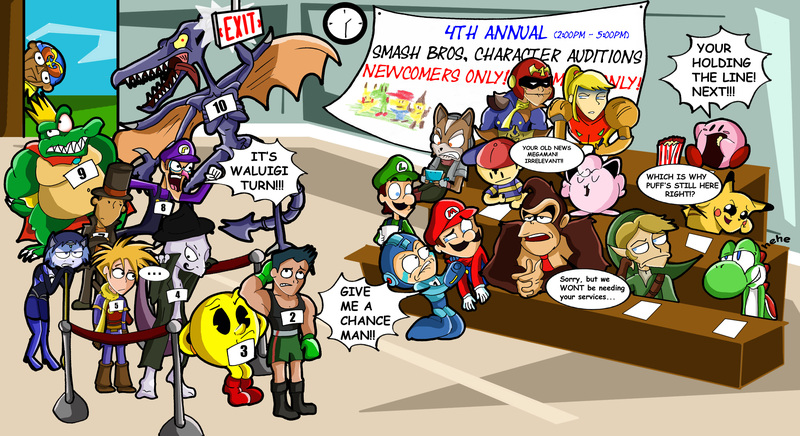 http://fc08.deviantart.net/fs71/f/2013/012/e/c/super_smash_bros_4__day_one_auditions_by_xeternalflamebryx-d5rb50c.jpg Cant blame him though, he was on his knees! The only third party characters I've ever wanted are Sonic, Mega Man, Simon Belmont, and Crono. So if Sonic returns (and I'm sure he will) my picks are half way there! @Classicgamer I like the picture lol. I saw nothing of megaman in the video, but the Villager is even better! Way to go Nintendo! This game looks great, this and Mario kart 8 are my favorites. Can't. Stop. Watching. Video. Over. Again. 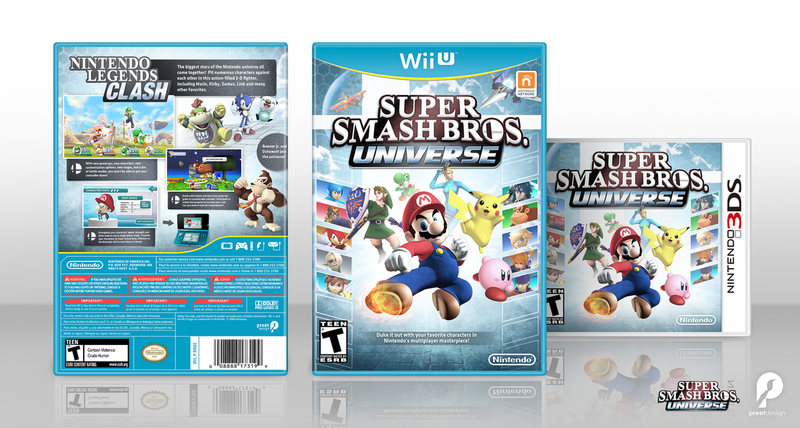 Thanks, @Pinkkitty I think should be Smash Universe like the fake box art that keeps popping up all over the Net. Good thing Pokemon X & Y is coming out this year, keep ourselves busy fro Smash4,right? I still want Lloyd from ToS, but Megaman is a nice addition. @Classicgamer The 5th guy is Isaac from Golden Sun (my avatar guy)! Haha! But truly I hope he gets a larger role this time and becomes a playable character! The 3DS artstyle is awesome! I wonder if they'll reveal characters one at a time. They only revealed the very small core, the Villager and Mega Man. There are like 50 more. It looks promising, but I didn't find anything that made me truly excited. It reminds me too much of Brawl...some of the stages are similar. And then Samus is doing what looks like her final smash from Brawl? I sure hope everyone gets new final smashes. Ehh, I'll need more trailers and info. But I'm sure they can't go wrong. Online is where this game will truly shine. The game looks good, but I fear we'll have another Brawl moment - the game will be amazing until you go to Melee and back. Remember how much of a deal Melee was? I'm glad to see Mega Man included, as well as the Animal Crossing Villager. I just hope they don't F up the Event matches and Classic mode again. @Lasermaster123 I'd love to see Isaac as a playable character. I would also love some of the Djinns as assist trophies. I still want Ridley playable. @Yasume - this looks nothing like Brawl. Aside from the obvious Smash hype, this video just makes me think that a Wii U Animal Crossing would be amazing. That said, I look forward to the full roster. Hopefully Fire Emblem characters make an apperance! It looks great so far. Hopefully they make a commitment to making it a fast, balanced fighter as well as having as many modes as Brawl. @Classicgamer Yea! I would like Isaac to be playable instead of Matthew because the former is more likeable AND he is more of the series representative. It would be cool if they implemented something for his latent Mars star powers or something. Could be a great Golden Sun 4 hint Both costumes though. His old style and maybe unlockable new looks or vice versa. Djinns and Summons in the game could add a lot of diversity but I doubt Nintendo would give Golden Sun such a prominent role. I will be happy if they just make Isaac playable and some other character as well if possible! You have terrible eyes then. Addition of AC character is flawless. they should have chosen way better music to at least make the trailer more exciting. I'd rather them just stick with Megaman, Sonic, and Snake. It's a Nintendo fighter, not a 3rd party mash up like Playstation All-Stars. @Lasermaster123 That would make me spat out my drink and make me wanna slap the nearest person (gently). seeing the introduction with animal crossing and the villager in the game made me laugh SO HARD !!! 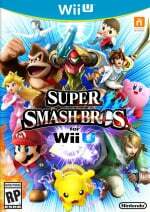 Bowser's colour scheme is noticeably washed out when you look at the Brawl picture (second link). He has much better colouring in the first pic (from this upcoming Smash Bros. release). @Lasermaster123 Personally, I'd prefer having Felix as the representative. In my opinion, Isaac is too much of a goody-two shoes and we have plenty of those already in the roster. Not to mention Felix had his own unique Psynergy (which TECHNICALLY Isaac could learn but never proven) Sand which could be used for some odd fighting styles. He'd probably have a more brutal style as well something that isn't quite so common in the current roster. But yeah, game looks great so far! 3DS version does look like it's much further along than the Wii U version. It actually looks like the 3DS uses Brawl's assets with some improvements and with an SSF4-style black outline. The Wii U version still looks pretty early, so I can see the game looking MUCH better once it's closer to launch. I love this art style. I wont go as far as to say it looks like Brawl's art style. It looks more polished and cartoony; I like it. It would surely be a pleasant surprise. Felix was the main character of the 2nd game but in the end they made Isaac the series representative. I also feel that in the 2nd game, Isaac's nature had changed quite a bit and he had become quite the hothead. He clearly told Karst and Agatio to scram off and was ready to take on the Proxians when they started talking about Saturos' death. He has the same moveset as Felix so he can be aggressive as well, in Golden Sun 2. Also he has the Mars star power which adds loads of twist to the equation making him more powerful than Felix, 2nd after Alex only. Finally, Isaac made an appearance in GS 3, not Felix. P.S. My profile pic is Isaac so I would support him right? Hope they announce more characters and a Namco Bandai character also. This trailer shows an incomplete list to me. Though actually I can see how you can think that it looks like Brawl. I believe the game only started development probably early last year or around the middle. So far it seems like they just imported assets from Brawl for the 3DS and Wii U versions to use as a base. It's still early, so the Wii U version may very well look far better than what we see now once it's closer to release. The 3DS version on the other hand looks ready from a visual standpoint in my opinion, but perhaps they'll try squeezing out just a bit more between now and release. It's surprising that they already have something to show for this game. @Lasermaster123 Not sure why you brought power into this since it wouldn't be noticeable anyways unless they both showed up in the roster. After playing the first 2 games it just feels like Felix is a much more fleshed out character than Isaac. Isaac just feels blank as a character. I guess it's just personal preference though, since I don't like blank characters (in RPGs) unless I created them from the ground up. I BETTER BE F*******G IN IT!!!! 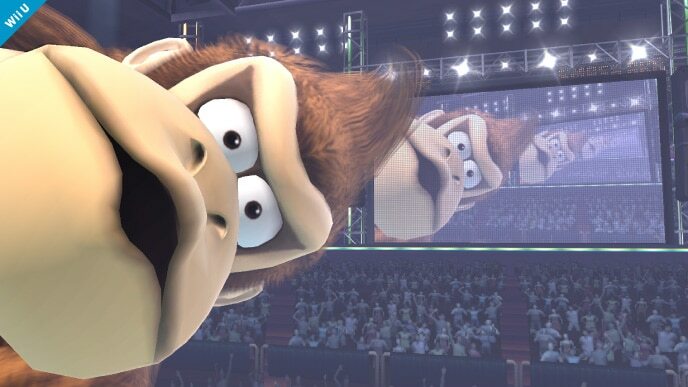 http://www.smashbros.com/images/character/donkey_kong/screen-7.jpg Donkey Kong wins the Internet. Also..there are people in the audience instead of characters and what not. Am I the only one who's wondering why they didn't show Little Mac? Anyway, Mega Man is a cool addition, hope this is the prelude of a Nintendo exclusive franchise. There can be a more variety of moves with his fire power set. Also I feel he would represent the series better as he was the poster boy in Golden Sun 1, pretty major in Golden Sun 2 and the wise father like figure in Golden Sun 3 (with his face still representing the series pasted on as Matthew). He has appeared more and thus be a more logical choice I would say. His personality was fleshed out more in Golden Sun 2 and 3 while Felix mostly in Golden Sun 1. PITTY HAS HIS UPPERDASH ARM!!!! As much as I like Mega Man (and Snake, etc), I still can't get comfortable with non-Nintendo characters in Smash Bros. I know I'm being way too much of a purist, but for me, Smash Bros. should be the Nintendo universe only. I guess this is where the franchise is going though, so it seems imo Melee was/will be the last pure Smash Bros.
like 3ds one because it looks very okami + 3d modes and wii u is pure awesome! @Classicgamer, yeah i hope Fairy orbitars!! Screw you school, you can wait!! Mega Man sounds like a pretty cool character. I wouldn't doubt it! I haven't played much Mega Man, but I need to start doing so. HYPE!!! since mega man was in ssf2 maybe nintendo took inspiration from mcleod and brought him in. Can i get a My wish has come true! They outdid themselves whith Mega Man's grand entrance/cut scene.the greatest part of the directio period. We get Mega Man and a Villager. @SonicOfChaos The first blade would be cool too. I wouldn't mind seeing him use the Great Sacred Treasures as a FinalSmash and pwning the hell out of everyone. And throw a few characters from Kid Icarus in there too. Oh the Eggplant Wizard! Everyone turns to eggplants and becomes useless! MWHAHAHAH!! WHOA AWESOME!!! Though I couldn't find something to do with Mega Man... This looks great! Was one of those courses Sanctuary Falls, from SONIC?!? HYPE!!! PIT CAN HAVE DIFFERENT WEAPONS!!! My bro showed me Mega Man on his 3DS, and that was just great. He has great powers and is pretty cool! More HYPE!!! Finally some good news on this website. i think megaman was there just to build more excitement than it should because it didnt show the other new challengers. megaman is a great edition, but think of namco also. I expected it to cme out in like, 2017. But if history repeats itself, it probably will. @One-Winged-Pit No, there is actual gameplay in the trailers. I wounder if there'll have a main story line where they ACTUALLY TALK. HOLY SHIZZEL! epic looking, also villager is included. Would you just look at the Villager? He's killing everyone left and right and he just smiles. @Fingeldor it's only the whole video I guess; maybe on smashbros.com @WaveBoy There's a full video on youtube; the one on facebook is only half. @Joshers744 I would recommend starting with 2. Megaman2 is the icon for the series. Be ready for a challenge; I recommend starting with 2, flashman stage, and play on 3ds so you can create a restore point anywhere. The game is hard for people like me with not a ton of 2d experience. Megaman 1 is on a curve too with the first robot master you choose usually being the toughest. Good luck! Oh and I think each version will have exclusive levels; I didn't see a single level in both versions. 3ds edition had the spirit tracks train and nintendogs level and wii u had the arena and others. That leads me to believe they're making handheld references on 3ds and console levels on wii U. Characters might even be exclusive too but there's nothing to backup that. The Arena Stage in the WiiU version leads me to believe that the game will include Little Mac as Nintendo's Classic character for the game. But that would mean excluding Ice Climbers. The Balloon fighter item lets me know that they will probably not make it as a playable character. This trailer was the best thing I saw in the direct earlier. Loved it! And this trailer has mega man in it. 2014 I want it now. There's nothing else to say here. My Nintendo ID is Rafie82. Ya'll already know what it is. Add me so we can get down when it drops! Also if ya'll want some comp in the new Mario Kart! I am loving the new Link. How is megaman going to be different from Samus? @yoshisaredragon sorry, i got all excited thinking goku and ichigo might be in it. Oh and my bud tails!!! 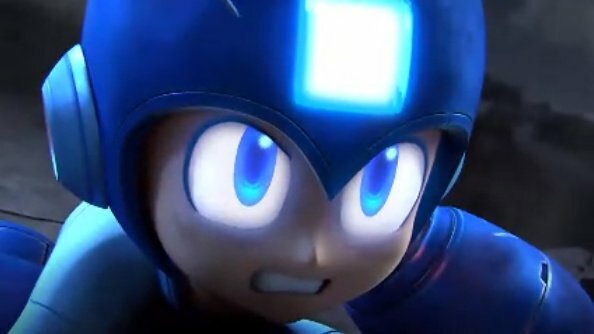 I've now added the Mega Man part of the trailer, as in the madness and aftermath I didn't realise it wasn't there. Enjoy! Im just putting out there. I wanna take a nap in Link's hair. It looks so fluffy! the game itself looks awesome, and the cutscenes just wow. I just finished making this, enjoy. @Yasume How does it look exactly like Brawl?? One of us has to be blind. Looks great, I want confirmation that Snake is returning though, he was on of the best characters in Brawl. yes yes yes yes yes yeah! So excited for this!! The 3d version looked good, but I'm stoked about the Wii U version. Megaman was a great addition! I still remember my very first smash brosh match: Mario X Kirby. I knew mega man is immortal, no matter what they say,.. But that music used for the trailer? they changed the Smash bros theme?..just curiosity. Anyone noticed Link is left-handed again? It seems he is only right-handed in skyward sword because you play with a wiimote and most people are right-handed. In actuallity Link is left-handed. I was EXTREMELY excited when they revealed Megaman. I thought "oh, the villager... nice..." Then they revealed Megaman And I was jumping for joy (literally, I got out of my seat and jumped!). This is great, not only for me, but for the millions who wanted Megaman in Brawl. People have made claims (more likely idle claims) they'd buy a Wii U if Megaman was in Smash bros.
BTW, what/who is Megaman shooting at the end, there? I hope, in this Smash Bros. They use Character Suits (costumes), for different types of characters. For instance: Mario/Doctor mario have a similar traits, so you'd stack them in one Character, in the selection screen. Instead of a brand new character, you'd get a 'Dr. Mario Costume' with different attributes. This would work well With "Starfox" team (wouldn't you rather be Peppy, than Starwolf? ), Link, Wario (WALUIGI! ), and even "Sonic" (however, tails can fly/glide, and Knuckles can glide). They sort of did this, in Brawl, with different colours/hats, but it could be built upon (I hated Biker-wario, so I always changed his clothes). This Creates just as much — if not more — replay-ability, than just getting more characters. I hope The Smash Bros. page is updated, with relatively frequent news... like in previous games. Time to bookmark the page . Getting new tab in july and the tab gives me 50 euro cashback. I'll keep that until the game gets released and then buy it directly! Counting down the seconds until I can own this beautiful masterpiece, seen the trailers like 10 times! And the most broken Power UP in Mega Man history returns. No more hacking Brawl to play Mega Man in Smash Bros.! 11 characters known so far. I'm hoping for the return of Snake, Sonic and of course the manliest of all men, Captain Falcon. Havent been so excited for a game since brawl was announced. Wii U is sold to me. And only in a year, too! Sony and Nintendo, I love you! They nailed Mega Man's 3D look perfectly. PERFECTLY. Give me Sonic The Hedgehog, and you have my seal of approval! That announcer is awesome! "Somewhere Woodman is crying a cryful tear in the forest" LOL These booth demo's seem fun, and with such a full of life zany announcer it makes the video above feel pretty retro! Damn Nintendo, you truly got me thinking about getting this game although i'm not a huge fan of the series. Why the heck do i still like Mega Man. Cool that Megaman will be in it. I still think there should be at least five 3rd party characters in this game. Bring back Sonic and Snake and throw in two new ones . Always though Simon Belmont should be in since he was such a big part of the NES days. His moves fit SSB perfectly too. But Mega Man? That's simply incredible! Looks amazing, too. This was a good day! 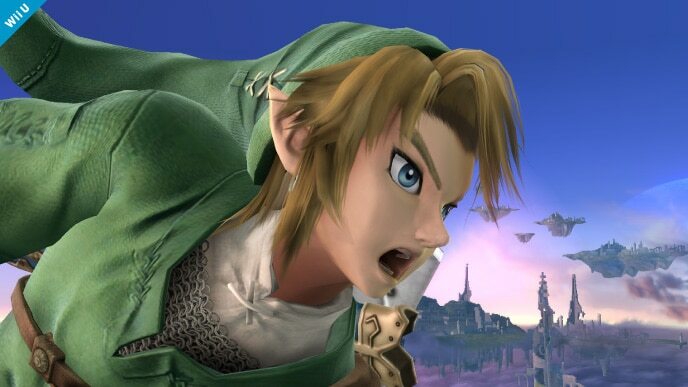 This Link looks like a bad*** compared to the Skyward Sword Link. Did anybody else notice that the arenas in the 3DS version trailer are mainly from handheld games, whereas the ones in the Wii U version trailer are mainly from console games? Man, those trailers were awesome! I just seen them just minutes ago. The only thing I really knew early this morning was MM in Smash, & the new title for Zelda. I know many will disagree, but I really hope of all weird characters that could be in Smash, somehow, Nintendo puts in a certain game master. Boxing ring = Little Mac. Just imagine if King Hippo or even Bald Bull made it in the roster. I also have a teeny weeny little inkling that a smaller sized 'baby' ridley i guess you could say will make it in there! Bowser Jr or a few select koopa kids(possibly using the pokemon trainer character switching method) will probably make it there as well. And lets not forget Starfy! @Waveboy Now I think you're letting your imaginqtion get carried away with the characters there. Was I the only one that got CHILLS when the music started up after Megaman started activating his Robot Master powers? CHILLS, I TELL YOU! CHILLS!!!! I want that remix on my computer, ASAP! I think I've only seen Villager without the black outline, so in the Wii U version only? Oh boy I laughed so hard because of that haha that is just freaky! and really, wii fit trainer? @Classicgamer Hilarious picture! Did you see how Captain Falcon is staring at Samus?! HA HA! I have to admit I've never played any Animal Crossing or Mega Man game (even though I am an avid gamer) but they did a good job of making them look like they'd be fun to play with and great additions to the Smash series.